The past few days we have been working on thesis statements. We have approached it backwards by asking some questions first. 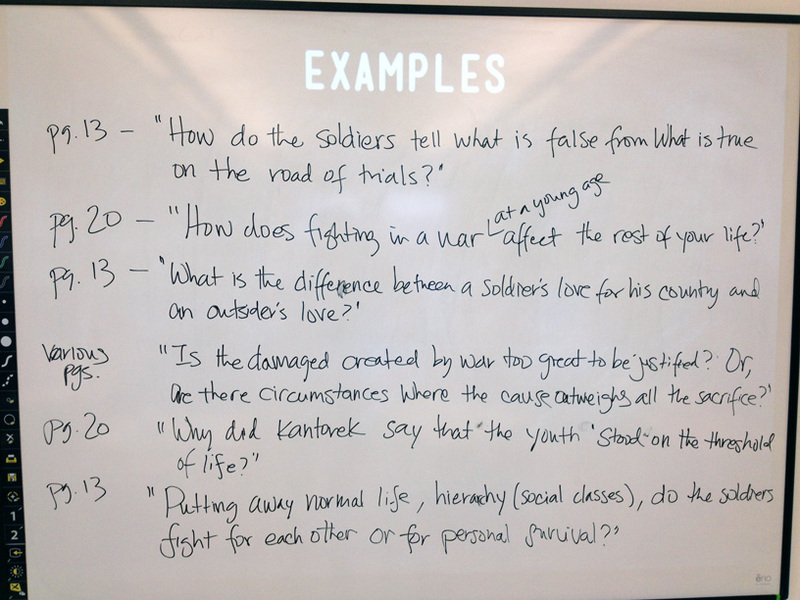 These questions are based on some close passage analysis that we did a few days earlier. There was a lot of great thinking and the frantic scribbling down of ideas yesterday. And remember, it’s all a process. Everything is in a working stage, nothing is polished or perfect. In fact, if you were to build out a real essay with this, you would most likely change your thesis once you got to the conclusion paragraph. And that’s okay. A thesis statement evolves as you research and think. But something you should be doing is editing: focusing on specifics, getting rid of generalities, and really cementing down an argument. We will be working and practicing this more and more over the course of the unit. But great start!!! The seeds are there! How do the soldiers tell what is false from what is true on the road of trials? How does the fighting in a war at a young age affect the rest of your life? What is the difference between a soldier’s love for his country and an outsider’s love? Is the damage created by war too great to be justified? Or are there circumstances where the cause outweighs all the sacrifice? Putting away normal life—social classes and the hierarchy of life—do the soldier’s fight for each other or for personal survival? What had the war swept them away from? Do you think the boys can be taken out of the waste-land? Did they feel isolated from the outside world or from each other? How are they not often sad when surrounded by death? In what situations do people start acting like animals? What is the difference between the world Paul was taught and the one he is in now? From what personal experiences did the soldiers elite sense of reality come from? I can’t wait to see what polished working thesis statements might come from these questions. Keep questions, keep thinking, and keep reading! This article was written on 30 Jan 2013, and is filled under In Class.